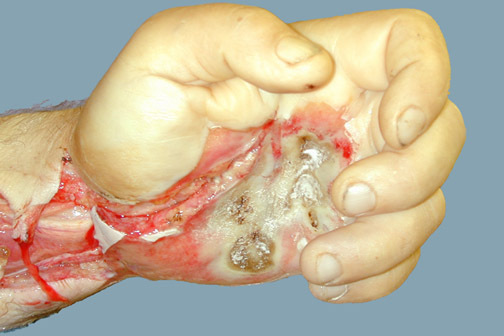 This man accidentally grabbed a high voltage electrical line, producing the entrance wound injury seen above on the palm of the hand, with subsequent soft tissue damage and swelling extending to the forearm. The appearance is similar to a localized burn. Below on the dorsum of the hand can be seen the wounds produced as the current exited the hand.